At least 36 people were dead and 147 others injured following a terrorist attack at an international airport in Istanbul, and all signs point to ISIS as being responsible, according to Turkish Prime Minister Binali Yildirim. The attack drew swift condemnation from officials in Turkey as well as the White House. "The United States condemns in the strongest possible terms today's heinous terrorist attack at Istanbul's Ataturk International Airport in Turkey, which appears to have killed and injured dozens," said a statement from White House Press Secretary Josh Earnest. "We remain steadfast in our support for Turkey, our NATO Ally and partner, along with all of our friends and allies around the world, as we continue to confront the threat of terrorism." According to Yildirim, three attackers carrying weapons arrived in a taxi to Ataturk airport, one of the world's busiest aviation hubs. Further details about the attack were not immediately available. Foreign nationals and police officers were among the wounded, according to Yildirim. Saudi Arabia's Embassy in Turkey said at least seven Saudis were injured in the attack and all are in stable condition. Yildirim also insisted there was no security lapse at the airport. 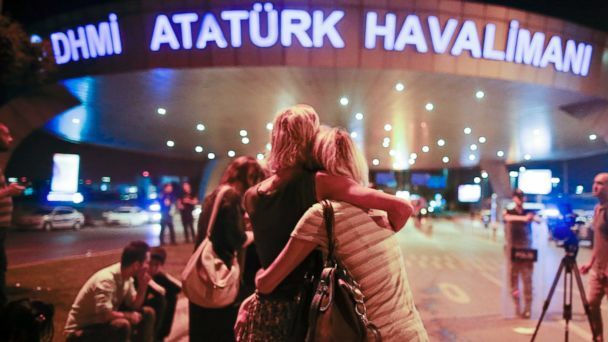 The airport has since been reopened, and flights between the U.S. and Istanbul have resumed. Airports in the United States have beefed up security in the wake of the attack, around 10 p.m. local time, a busy time for the airport, with flights arriving from Europe and leaving for the Persian Gulf and other parts of the region. Turkish President Recep Tayyip Erdogan issued a statement condemning the attack that "has no objective." The president also said the attack shows "terrorism strikes with no regard for faith and values," since it occurred during the holy month of Ramadan. "We expect the international community, especially the Western countries including their administrations, parliaments, media organs and civil societies, to take a firm stand against terrorism," Erdogan said. Turkey is one of the main European tourist destinations for Americans. A total of 181,298 U.S. tourists have arrived in Turkey so far this year, with 60,000 arriving last month alone. All U.S. Chief of Mission personnel have been accounted for, according to the U.S. State Department, and the government is "making every effort to account for the welfare of U.S. citizens in the city." Video posted to Instagram shows chaos inside an airport store as people took shelter following the attack. A photo posted to Twitter shows a deserted arrivals terminal inside the airport.